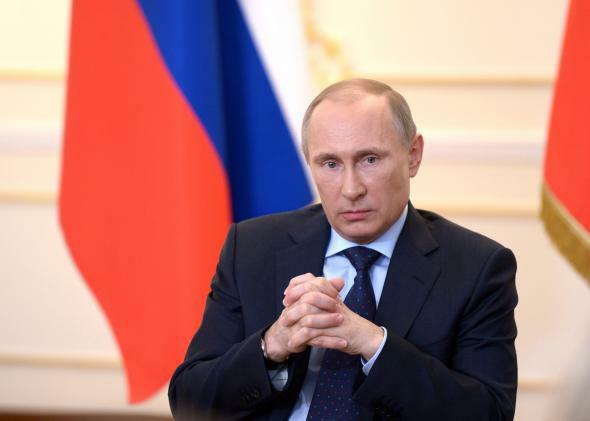 Vladimir Putin’s irrational behavior: Why the Russian president wins if we think he is crazy. The Russian president is more likely to get what he wants if we think he’s off his rocker. President Putin’s March 4 press conference, where he rambled about foreign conspiracies and repeatedly contradicted himself, gave weight to the idea that he is unhinged. The outcome of the crisis in Ukraine depends to an unusual extent on the intentions of one man: Russian President Vladimir Putin. In the last few weeks, since the collapse of Viktor Yanukovych’s Russia-friendly regime and Moscow’s precipitous invasion of Crimea, analysts have been obsessed with trying to get inside the Russian leader’s mind. Initially, when Russian troops without insignia appeared in Crimea, the assumption was that Putin was a strategic thinker, taking advantage of a weak central government and appealing to receptive residents who believed Russian propaganda about a fascist government in Kiev. He would bargain for some concessions, the thinking went, but was not so crazy as to risk a war with NATO and jeopardize years of efforts to improve Russia’s image abroad. It was believed Putin was engaged in ordinary brinkmanship. However, once the occupation deepened and the Crimean parliament approved the holding of a referendum to join with Russia—with the Russian government’s support—the narrative changed. Now, Putin’s actions appear to some to have been not a kneejerk decision, but part of a larger campaign to restore the Soviet Union, unite all the Russians of the former empire, or take over all of Ukraine. Others have gone further, arguing that Putin is off his rocker. There is the believes-his-own-propaganda theory that Putin sees himself in a replay of World War II and a struggle against Nazis. There is the living-in-a-bubble theory that Putin has shut himself off from the world and only consults with like-minded, nationalist ex-KGB advisers who loathe the United States. And there is the blind-rage thesis that, after losing his ally in Ukraine, Putin is simply acting out of spite by attacking an easy target. It may indeed be that Putin is deranged. His actions are certainly consistent with the portrait of an enraged, hypernationalist, conspiratorial madman who is heedless of the consequences to Russia and to himself. But they are also consistent with another possibility—that Putin is still merely engaging in brinkmanship, and rationally so. To understand why, consider strategic theorist Thomas Schelling’s concept of the “rationality of irrationality.” This can be illustrated through the game of chicken, in which two drivers are heading for each other at full speed, and the first to swerve is the chicken. A driver who appears crazy enough to prefer dying over chickening out will always have the advantage. It is therefore rational for a player to convince his opponent that he is actually irrational. To go back to the original metaphor, it’s called brinkmanship because the negotiator is prepared to go to up to the brink; the best tactician is the one who can make people believe he is willing to go over the brink. President Richard Nixon tried this approach when negotiating with the North Vietnamese, by spreading word that he was prepared to use nuclear weapons to end the war (the Vietnamese did not believe him). After Sunday’s referendum, in which 97 percent “voted” for annexation, the loss of only Crimea (whether formalized or de facto) might appear like a victory to the Ukrainian government and its supporters. Likewise, given fears of a full-scale Russian invasion of Ukraine, radical autonomy in the eastern regions might seem like a relief, even though it would give Russia guaranteed influence over Ukrainian politics. Even a commitment that Ukraine will not seek to join NATO (most likely to be made privately) would seem acceptable under the new normal. One danger of this strategy is that by getting too close to the brink, the players may accidentally fall over it. And Putin is indeed getting close. Busing Russian nationalists to fake rallies in eastern Ukraine and stirring up primal fears about Ukraine’s government risks unleashing forces outside of his control. It is easy to envision scenarios in which violent street clashes trigger mobilization by Ukrainian or Russian forces to protect “their” side, which could inadvertently result in armed conflict that no one wanted. But this is precisely the point: The risk of unintended escalation gives Putin a stronger hand. No one knows if Putin has been stoking Western anxieties and manufacturing craziness as part of a deliberate, orchestrated campaign. He has probably been improvising for much of the last three weeks. It is also likely that he receives bad advice and his perceptions of events are extremely biased. But given all the breathless claims about what may be going on inside the president’s deranged head, it is worth considering that Putin may be fully aware of just how crazy he seems.